Escif is an artist I was first introduced to in 2006 by Blu, who recommended him for inclusion in the Street Sketchbook book. 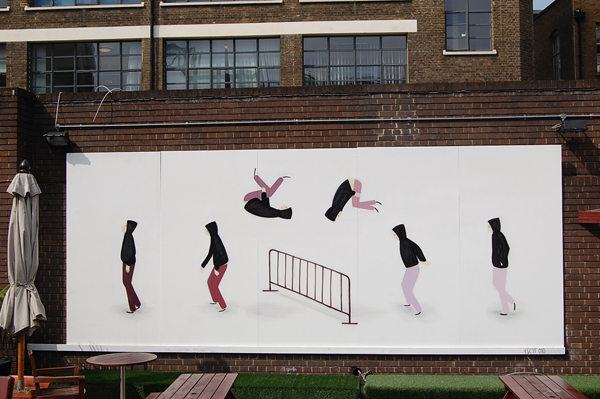 Since meeting him back then in Barcelona and the publication of Street Sketchbook, Escif’s work has continued to grow and develop. Constantly painting and producing, his techniques have become honed over time to a minimal but elegant style while his ideas have also become stronger – at times surreal, usually very funny, clever and approachable. 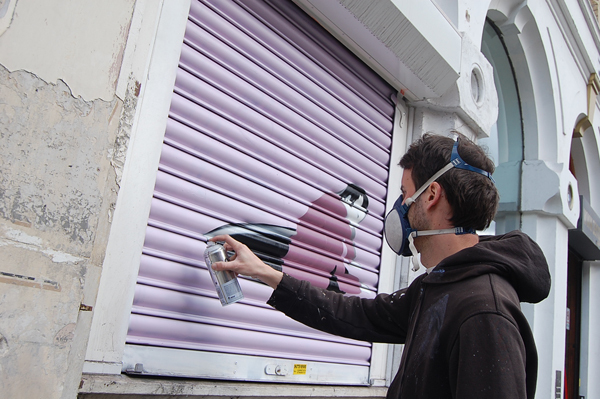 Photo above: Escif painting the POW shutters last weekend. 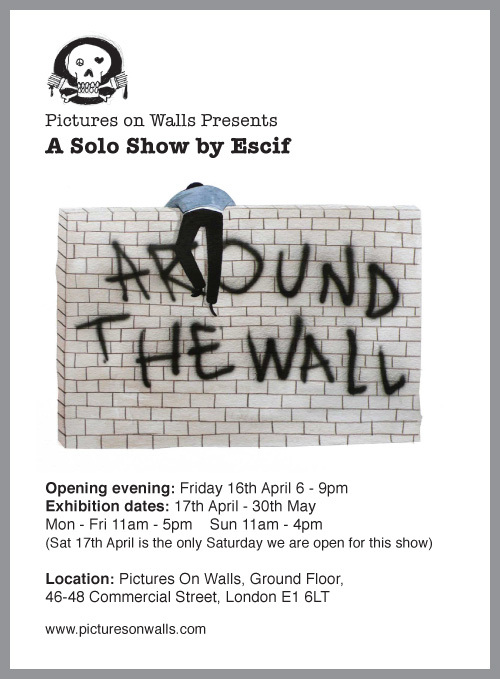 Years later it’s been an pleasure to invite Escif on behalf of Pictures on Walls to create a show at POW’s showroom space. He has been working on the show for the past 5 months so its packed with ideas and very exciting to see it come together this week. 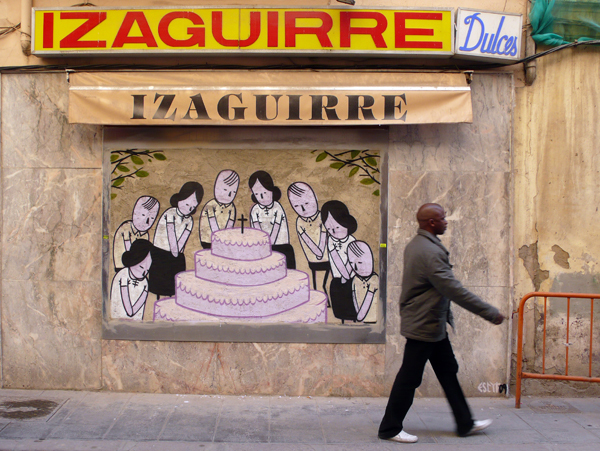 A little background about the artist:- Escif’s home is Valencia where he began painting on the streets since around 1997. Inspired by the Graffiti movement he describes his work as a kind of contemporary mural painting. Valencia has proved to be the perfect training ground for Escif’s art, as unlike Madrid or Barcelona it’s possible to paint quietly in the city centre without prosecution. The faded walls and abandoned spaces of Valencia’s historical streets also provide the perfect textural backgrounds for Escif’s work. 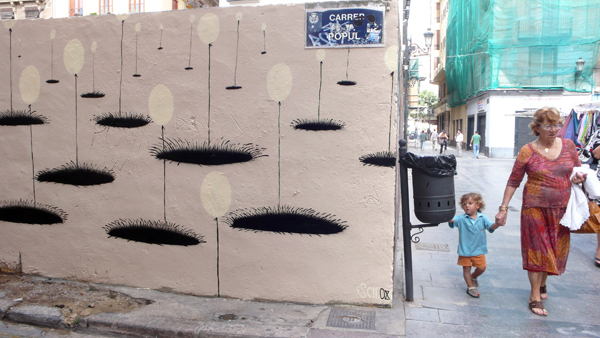 Around 90% of his street paintings are illegal but he has also organized legal public mural projects with friends and on behalf of the University of Valencia. Escif’s output is prolific, painting pieces each week in his home city and on travels to Morocco, South America, much of Europe and Cuba.